Last night as my husband and I walked out of Watauga High School, we high-fived each other as we celebrated the first of our last things we'll ever have to do as parents of children in public school. We never ever have to go to Open House again. OK, the experience is not horrible, but other than putting a face to the name of a teacher our child sometimes mentions, the exercise is almost pointless. Sure, I did glean a bit of helpful information in the 'Just for Seniors' meeting beforehand, but that was separate from the Open House. Since we've done this thing 12 or 13 times before, we know the drill. We sit in small chairs. We watch teacher write email address on the bulletin board. Teacher says things about the class. Then parents try to impress the teacher with their questions. Whoever coined the phrase,' There are no stupid questions,' was wrong. "My daughter already did her homework you gave her today. May I turn it in now?" The question of course, was followed up by great big sucking up noises. To the teacher's credit, she didn't miss a beat and ignored the woman. Another favorite stupid question of mine was asked two years ago when a woman raised her hand in English class and in front of God and everyone announced her daughter's huge emotional problems. "You're going to be able to deal with that, right?" she asked the teacher. "See me after class," the teacher replied. Although last night was fairly tame (overall parental attendance was low), we did hear one entertaining question which I fear to reveal because I never know who reads my blog anymore. But, when I heard it asked in French class I knew immediately I had a winning stupid question submission to our private little contest. And almost immediately I knew my husband agreed because from behind he gave my ponytail a pull. 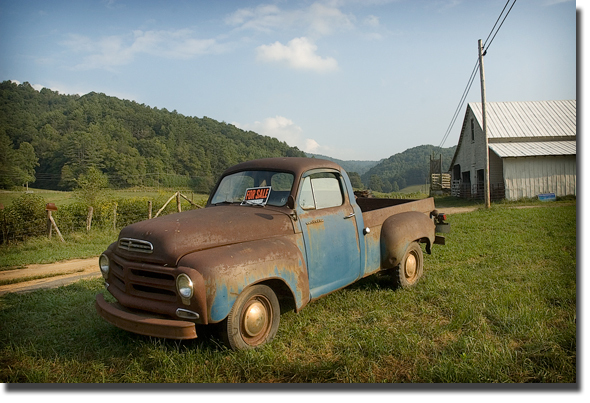 The photo is an old Studebaker for sale and is sitting in front of the Taylor family farm in Valle Crucis.